When you look at your home’s exterior, you might notice that something is missing if you don’t have soffits and fascias installed. Most homeowners have them added as part of their roofing installation. If you are building a new home or replacing your roof, you need to know exactly what soffits and fascia are, how they help your home, and how to care for them. What are Soffits and Fascias? To locate soffit on a house, you need to look at the area that spans beneath the rafter tails. Fascia, on the other hand, is the area that is exposed at the end of the rafters. Since soffit and fascia are part of the aesthetics of your home’s exterior, many people want the color and material to compliment the rest of their home’s exterior. Both parts are usually made of materials like aluminum and wood. While most people think that the sole purpose of soffits and fascias is to give your home’s exterior a more finished look, their use goes beyond just visual appeal. In fact, these roof parts are just as functional as they are fashionable. Both components play an integral role in keeping pests out of your home. With proper installation, you can protect your home from nesting birds, bats, and squirrels. Soffits and fascia also provide a stylish way of hiding your attic’s ventilation. Lastly, they prevent moisture from coming into your house when the wind blows rain under its eaves. 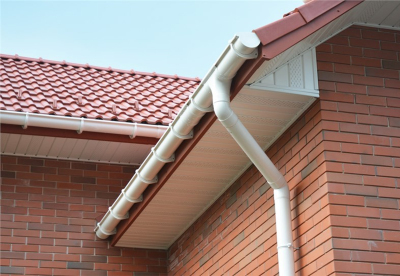 As with most things in life, you need to maintain your soffits and fascia in order to ensure that they are in optimal condition. You should check both parts of your roof annually while you look over the rest of your roof. If you notice any peeling paint or cracked seals, you need to consider replacing or repairing the issues. You also need to inspect your soffits and fascias for mold and mildew. A soft brush and a bleach water solution can easily clean it. Finally, you should also look for signs of insect nests, such as bees or hornets. Depending on the size and location of the nest, you may need to call professionals to handle the removal. If you are ready to install beautiful, new soffits and fascia in your home, contact the experts of My WindowWorks. You can give us a call or fill out our online form to request a free quote.